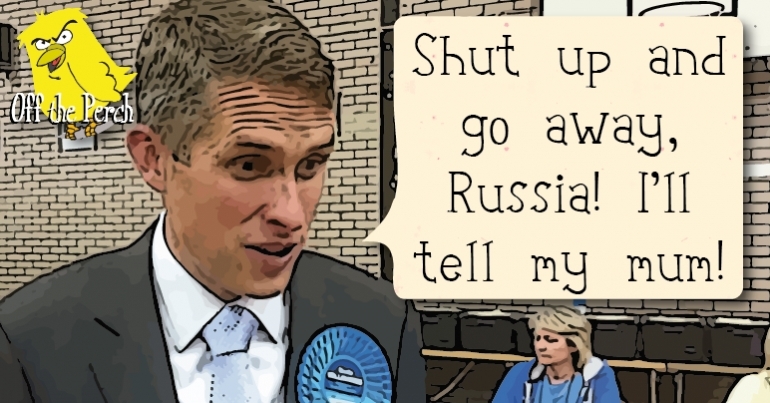 Gavin Williamson, Defence Secretary: 'Russia should go away - it should shut up.' I'm so pleased that the government hasn't forgotten it represents everyone in the nation, even children at KS2. I love how far away from his "Lines to take" that would have been. Great stuff. so how they can exclusively pin the blame on Russia for the attack without any hard evidence, truly befuddles me, it literally could be anyone, any country, not least US and UK, who would be the main beneficiaries of this dangerous blame game. 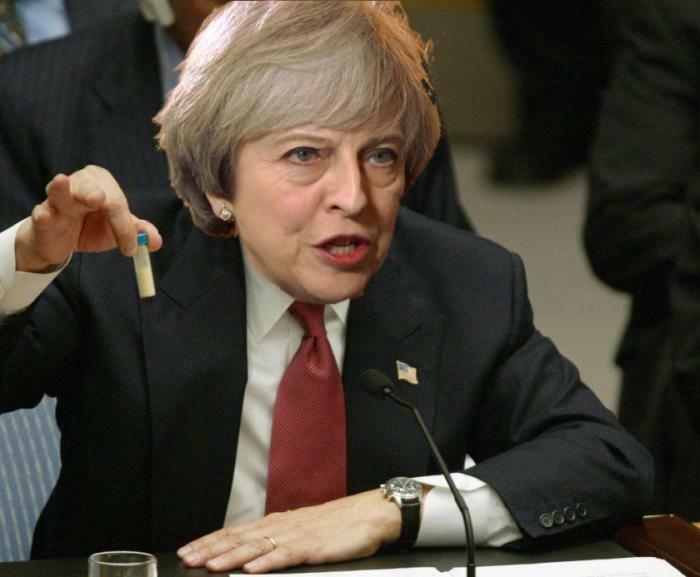 Russia’s poisoning of Litvinenko plays so nicely to Theresa’s “Russia did it” tune this time round, that she can’t even imagine why providing evidence is necessary in the Skripal’s case before delivering her insane and frankly cringe-worthy ultimatum to the Russians. It is a fundamental concept of British law …Innocent until proven guilty. But corrupt leaders hate proof. That is why they reduced police and intelligence funding. In my opinion this is an elaborate and highly deplorable election ploy, not only to demonise Russia but especially to discredit Corbyn, because SHE KNEW he would go for peace and dialogue and thorough investigation based on hard evidence. She will use this to defend her Trident policies, to deflect from Brexit disaster and to toughen up her ‘weak & wobbly’ public image, not least she will claim Corbyn is a ‘traitor’ and ‘Kremlin Stooge’ (as we’ve just seen on Daily Fail front page this morning) for his pro-dialogue, anti-Trident views. So let me just remind you…. Theresa May - the leader of a party that accepts money from Russian oligarchs while aiding the oppression and murder of people in Yemen and helping to supply weapons to Isis through Saudi who then attack us here in the UK ... yeah, I believe every word she & her government spout. But enough about Russian spies, I am rather fascinated by the mysterious “suicides” of Dr Kelly and his assistant, Dr Richard Holmes, who worked at Porton Down and who, just like Kelly, went out for a walk one day and was later found dead in a field in an apparent “suicide” just a couple of miles from Porton Down (where else!). Strangely reminiscent to Dr Kelly’s “suicide”. Coincidence of course. What else could it be! MI5 would never murder anyone in the UK. That's why the medical reports on David Kelly were classified for *70 YEARS*. So please, just for a moment, lets come out of our nationwide cognitive dissonance and admit that state sanctioned murders are not Russia-exclusive. There is undeniable logic that right now, everyone is winning in this. May is gaining much needed strength at a time where the UK Government looked shambolic, Putin gets to look, well, Putin like ahead of Russia's elections and it gave Trump the excuse he has long been looking for to remove Tillerson. Everyone is winning? Tell that to the Skripals. Another theory here although not from a very good source. Wow, just wow. Firstly, Russia are now denying that neither they nor the USSR ran the Novichok weapons program. The fact that you refer to the defector Mil Mirzayanov suggest even you don't believe that lie. But we'll overlook that. Mirzayanov released details of the structure of Novichok, not a recipe as you put it. Actually creating the stuff is still hugely difficult, and extraordinarily dangerous. Realistically, very few could do it. I will not make the mistake of assuming the lack of published evidence means the evidence doesn't exist. Iprefer my government to protect it's sources. After all, this whole event started with Russia showing what it does to such intelligence sources. It is amazing that some people are so keen to place so much more weight on statements from Russia than from our own government and intelligence services. This despite Russian lies over Georgia, Crimea, Eastern Ukraine, MH17, Syria, Litvinenko, Sports doping etc. etc. The list goes on and on. There has been a chemical weapons attack on British soil, and yet some are so desperate to defend the indefensible, simply because Jeremy says so. Finally, David Kelly was walking near Porton Down because he lived near Porton Down. Now why do you think a biological weapons expert would live near Porton Down? I wonder where he worked? Corbyn says so true it must be, all hail Jezza, cult like subservience. The world less corbyn and his followers are in agreement! Wow indeed… Firstly I would kindly request that you do not misquote, deliberately or accidentally, what I said about Corbyn. Corbyn has not for a moment tried to “defend the indefensible”, where did you get that one from, in my reply or his speech? I must admit I had to re-read his yesterday’s speech. Is demanding that our response as a country must be guided by the rule of law, support for international agreements and respect for human rights, that our response is decisive, proportionate and based on clear evidence now regarded as a treason? Apparently so! Personally I loved his speech, it was a very brave speech of a true leader; it would have been so much easier for him to just go along and agree with everything that May said, not stick his head out, especially during the time when he’s looking to be elected as the next MP. No, he always stays true to his principles (unlike May), and challenges every time he thinks a challenge is due, no matter if it plays to his political advantage or not. "SWWood"]Actually creating the stuff is still hugely difficult, and extraordinarily dangerous. Realistically, very few could do it. Precisely! It is quite obvious that both UK and US have their own access to Novichok and can produce it, if needs be. It’s hard to imagine that Mirzayanov did not share the formula with his CIA handles. I couldn’t find the specific source of your reference here, but they are certainly not denying that Novichok was invented in the USSR. Actually I said it’s Dr Holmes, who went for a walk near Porton Down, David Kelly’s body was found in Oxfordshire. Very odd comment, not sure what you were trying to refute here, but good job completely ignoring the key point. The Skripals’ case almost exactly parallels that of Litvinenko (aside from the identification of immediate suspects and the fact that currently we’re dealing with an attempted assassination) and, though one player has a starring role in both, the denouements have been rather different. With Litvinenko, first the government gagged the inquest with a PII; then the Home Secretary, one Theresa May (ever heard of her? ), after repeatedly refusing requests for a public inquiry on the basis that this would upset the president (Putin, that is), had one eventually squeezed out of her; and finally, after publication of the report of said inquiry in early 2016, which pointed the finger of ultimate responsibility at the Russian state, Mrs May robustly froze the assets of the two principal suspects and the Foreign Secretary (some chap called Philip Hammond) robustly asked the Russian ambassador to convey a slapped wrist to Vlad the poisoner. So what's changed in a mere two years? Well there was an awkward little referendum which was supposed to put to bed internecine Tory conflicts but only succeeded in laying bare the rank and incestuous secrets of a model of familial dysfunction. This was followed by an awkward little election in which a strong and stable wannabe became a weak and feeble woman virtually overnight. Then, several disasters later (Brexit ‘negotiations’, Grenfell Tower mishandling, dubious NI alliances, Boris Johnson etc. ), the Tories are in a bit of a tizzy and dropping in the public’s estimation faster than a cannonball off the leaning tower of Pisa. I guess all this goes to prove that a 'Kremlin stooge' can be turned. Firstly, I'll apologise for the misquote, it certainly wasn't deliberate. I was a little confused by the point you were trying to make. (It was the "where else!" that threw me). Seemingly you are suggesting a link between two suicides. I find that a little ironic given your insistence on hard evidence, of which I would suggest you have none. Moving on, you state that it is obvious that both the UK and US have the ability to produce Novichok. That is again an enormous assumption on your part. It simply is not the case that knowing the molecular structure of a compound automatically means you can recreate it, or would even want to. You, however, have decided that we must possess Novichok, otherwise your theory falls apart. But deputy foreign minister Sergei Ryabkov said Moscow never had any such programme. "I want to state with all possible certainty that the Soviet Union or Russia had no programmes to develop a toxic agent called Novichok," he told Interfax news agency. Seems pretty clear to me. What is important here is that your argument for believing we possess Novichok is based upon the testimony (and book) of Mil Mirzayanov, the director of a program the Russians deny existed. Either they are lying, or Mirzayanov is a fraud (which he isn't). You swiftly brush aside the numerous cases of Russian aggression, and blatant lying, and try to justify the invasion of a neighbour because they couldn't have a referendum. Simply astonishing, but of course if you don't want to see the obvious pattern emerging here. So yes, I do think you are defending the indefensible. You wilfully ignore the fact that Russia had the motive and the means the launch this attack, indeed they are probably the only country who could. And let's not forget they have form for this kind of thing. However, some people will continue to ignore what is staring them in the face, and instead try to create increasingly far-fetched scenarios in order to shift the blame away from Putin and onto the someone else, namely the UK and US. Why? Because this incident blows an enormous hole in Jeremy Corbin's national security strategy. And seemingly getting Jeremy into number 10 trumps all other considerations. so the nerve gas saga is costing 16 billion quid then, rather expencive in my eye. The war of words is escalating with our Defence Secretary threatening to give his Russian counterpart a Chinese burn. Murray's supposed credibility hinges on his status as "former ambassador" which feels about as relevant to his judgement now as David Icke's status as "former footballer and sports broadcaster." Having come at this with a pretty open mind and no pre-existing bias (that I am aware of) towards any of the sides, I am now exhausted by the range of mostly opinions peppered here and there with a wee amount of fact; usually just enough to tempt you to believe. Sadly, I do not know who to believe as the loudest proponents of each end of the story have well documented track records as being somewhat more than economical with the truth, in fact often just brazenly making it up. Those who are not tarnished with this complaint, mostly wear their bias as a badge of pride and therefore cannot be relied upon either. It is a sad state of affairs and all I can ascertain with some degree of certainty is that a person or persons currently unknown used a nerve agent of currently undocumented origin on a former Russian spy and his daughter, for unknown motives, in a public place in Salisbury & in the process exposed a number of civilians and emergency personnel to it as well. I suspect that the security services probably know more than this, but for fairly understandable reasons are remaining tight lipped about it. Interesting read that looks at the facts but the main bit that intrigues me is why the Russians chose now if indeed they were responsible.